Can I pay by credit card without a PayPal Acocunt? Yes, we accept both PayPal and direct credit / debit card payment. See "How to pay by credit card directly?" below for details. Your credit card number will only be sent to PayPal and not to us. Your information sent to PayPal is encrypted with the latest Secure Socket Layer (SSL) technology. How to pay by credit card directly? After clicking the "pay button" at the order page, you will be directed to PayPal's checkout page, there is a "Don't have a PayPal account?" section on the left hand side, where you can proceed with direct credit / debit card payment, and it does not require any registration with PayPal. Please also refer to the "credit card payment illustration" below. My credit / debit card is not accepted by PayPal. Why? Your card is linked or associated with an existing PayPal Account, but you are trying to pay with the card without logging in to PayPal. PayPal's limit on Non-Member credit / debit card usage - For security reason, PayPal may limit the payment amount if you use it without registration. Therefore, chance is that you have already reached the limit, and PayPal will not allow you continue using the credit card without registering with PayPal. The aforesaid limitation varies on different credit card or country. Based on our experience, payment of over US$200 may require registration with PayPal. If my credit / debit card is not accepted, what can I do? Try to pay with another credit / debit card. 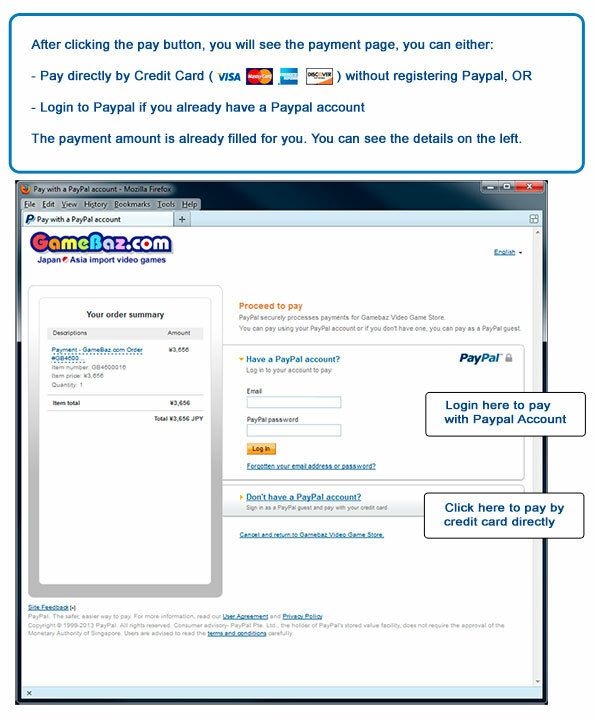 If option 1 is not possible, you may have to register with PayPal to complete the payment. Registration with PayPal is free. An alternative way is to use PayPal's eCheck function as a payment, where you deposit the money via bank to your PayPal account, and the money become your PayPal's balance, such that you don't need to pay through a credit card or alike. Otherwise, please consider other payment methods, such as Western Union money transfer, or bank transfer. For payment methods we accept please refer to here. Below is what you will see on the PayPal checkout page, and how you should proceed with (1) Direct credit card payment without a PayPal account, or (2) Pay with a PayPal account.